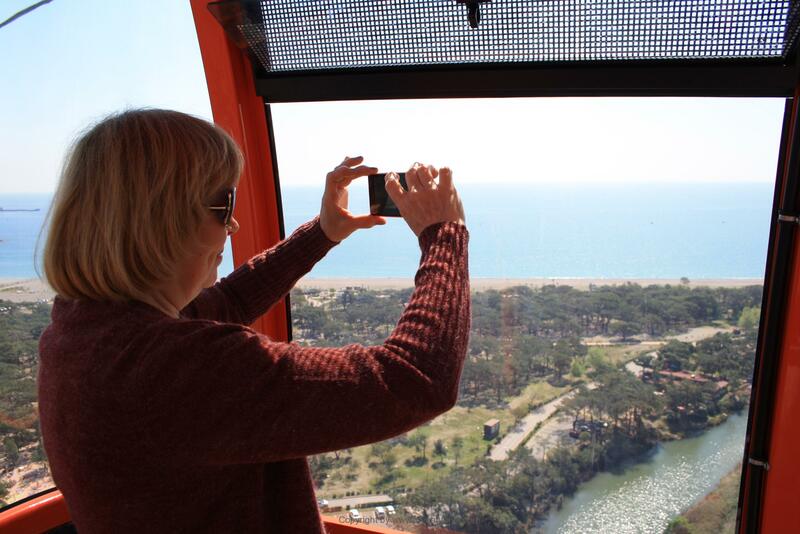 When I was in Antalya this April, I was lucky that the new cable car had opened just 1½ month earlier. The cable car has been expected for years and we have been waiting and waiting and waiting. But nothing happened. Until February this year, where the track opened with a lot of celebrations, free entrance for a week and a visit by the mayor. In fact, the cable car has been projected since the 70’s. But due to politics and economics, it was only started in 2014 and has taken 3 years to complete. 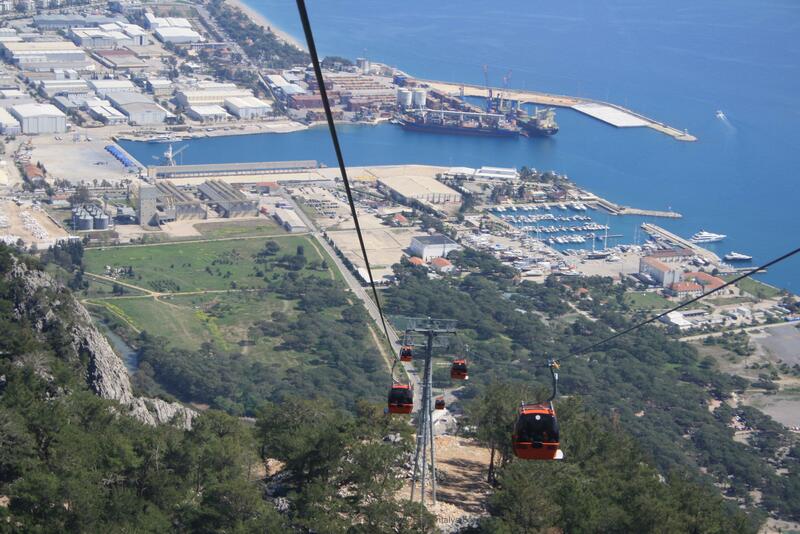 The cable car goes up to a small mountain, Tünektepe, which thrives on the outskirts of Antalya and with the most beautiful views of the big city and a large part of the Taurus mountain range. At the top of the mountain there is a small restaurant that has been there for decades, but is now renovated. 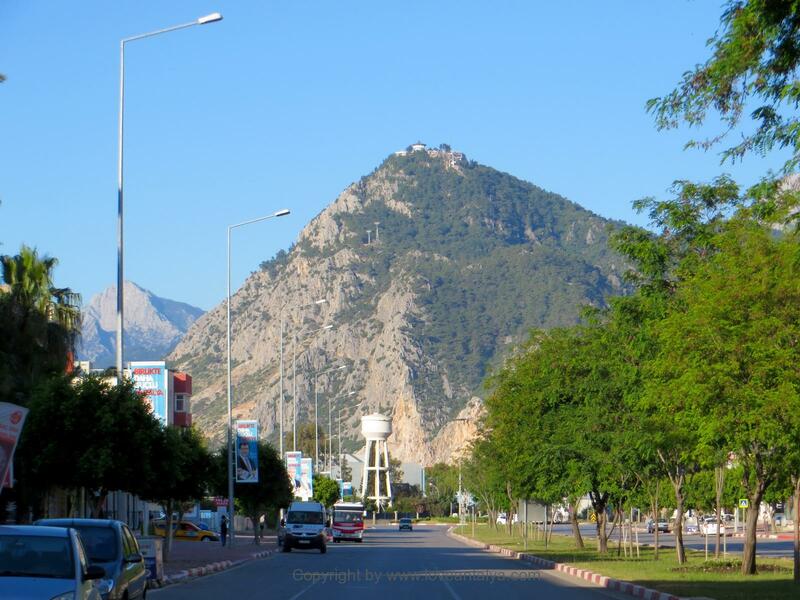 The place has always been of importance to Antalya. Especially up through the 60s and until the 80’s it was famous and notorious as the gambling and casino mecca on the Turkish south coast. And this is where the beautiful cable car comes in. 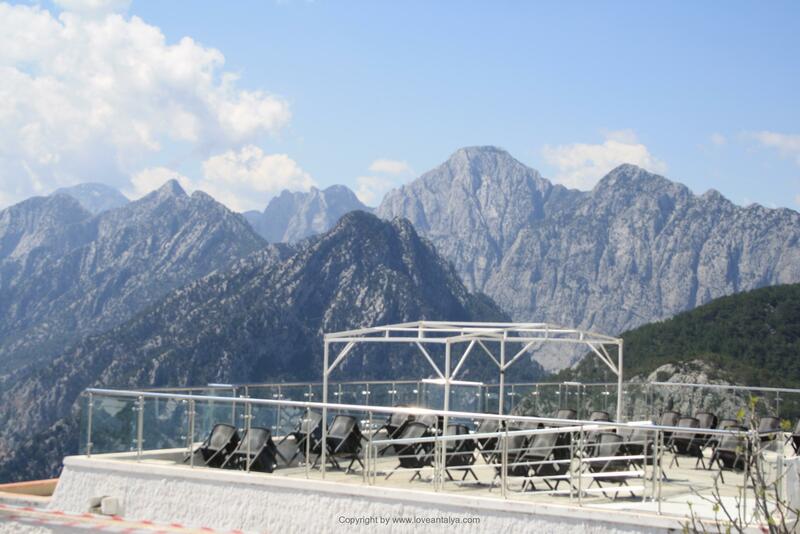 For what a nice, different and refreshing thing to have a cable car in Antalya and easely go up at the top of the mountain to enjoy the beautiful view. It’s a nice little trip, which takes a couple of hours in total and will be a big success. The locals have already embraced the cable car (also with their picnic baskets) and the tourists are quickly getting their eyes on it. It is certainly a great way to see the city from above – and with a view you can not even begin to imagine. I could try to describe the impressive size of the city, the beautiful coastline, the harbor with the container and cruise ships that come in and out. 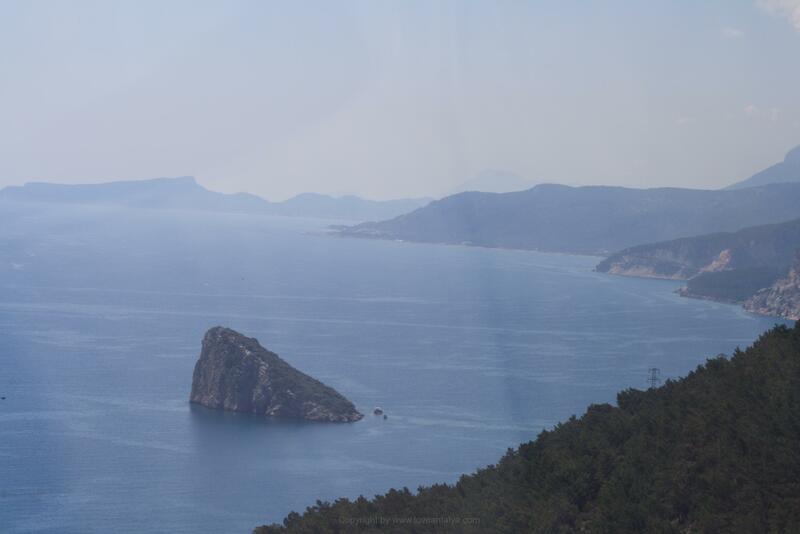 Or the beautiful Sican adasi (also called Rat island) , lying like a crooked lumpy land in the middle of the water, the road and the forest landscape towards Kemer and finally the big snowy Taurus mountains towards the inland. But I let the pictures speak for themselves. For once, the words simply doesn’t cover it. The view simply takes away your breath. The restaurant and the road were built once in the 60’s. The restaurant rotated 360º around, so you could sit and enjoy the whole view while playing at the casino or eating in the restaurant. It was also possible in 99, when I was there. There was the gambling just replaced with a restaurant. But, unfortunately, I do not know if the restaurant still rotates today. It was not to be seen, but I remember that it was so quiet that you almost did not notice it. A quite fun and different experience to take home with you from your holiday. 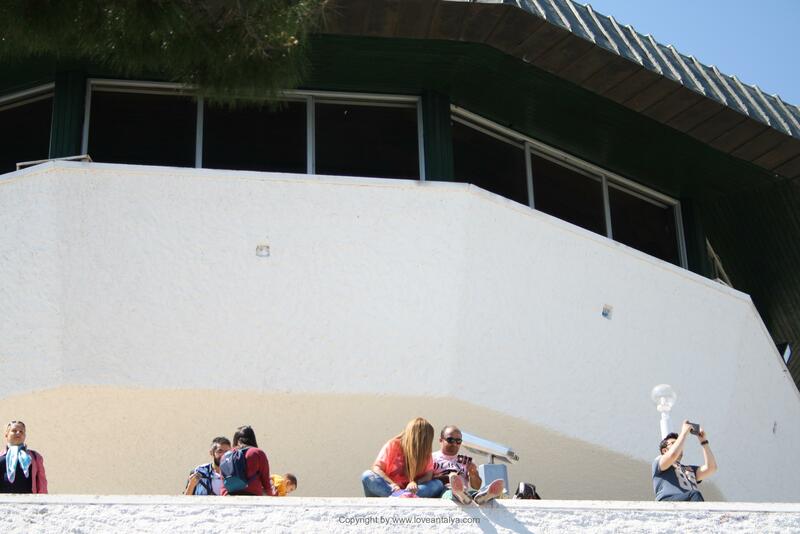 Today you can get the tea, coffee and cake in the indoor restaurant, but you can also get some fast food and drinks from the large outdoor terrace with the beautiful view. You should not cheat yourself for a treat here. It is a pleasure just to sit and look around. The trip up there with the cable car starts down from Sarisu Beach – as I have written about here. Sarisu Beach is located on the outskirts of the city – at the very end of the big Konyaalti beach. It’s very easy to buy the ticket and is not very expensive. About 15 Lira per. Pers. – just as good as 2.7 Eur – or 20 lira for 2 people. So it’s not expensive for the coolest vacation experience. The trip up to the top takes about 10 minutes with the cable car. The wagon is large and with glass for all sides, so you can enjoy the beautiful view all the way round. I had persuaded my sweet in-laws to take a trip with me. Fortunately, we had the entire wagon for ourselves, so we could take all the pictures we wanted without any obstacles. There is room for 8 people in the carriage and it moves with the speed of 5 m / s. So do not be nervous. It goes nicely quiet. 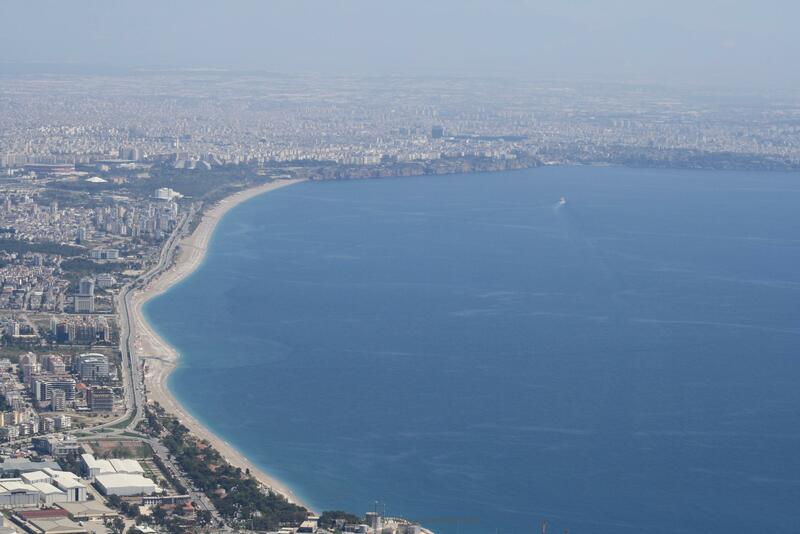 Although the Tünektepe mountain is only 604 meters high, it seems like a lot, when you are going straight upwards. The cable car itself is 1685 meters long. I’m willing to admit, that it was a bit fearful to hang over the road and the rocks, several hundred meters up in the air in a tiny little wagon, which sometimes stopped with a little pull (when people were getting in and out from the other wagons). I have never tried a cable car before, but it was nevertheless a really good experience. One I certainly want to try again with my husband and children, the next time, we’re in the city. The kids would love it – and I think my husband would do to. It’s not everyday you get to se your second home from above? It’s certainly worth spending a few hours here. So I would definitely recommend it and really think you should give priority to a trip on the cable car, if you’re going to Antalya or nearby. You will definitely not regret it. And you get the wildest postcards / family / panorama pictures ever !!! 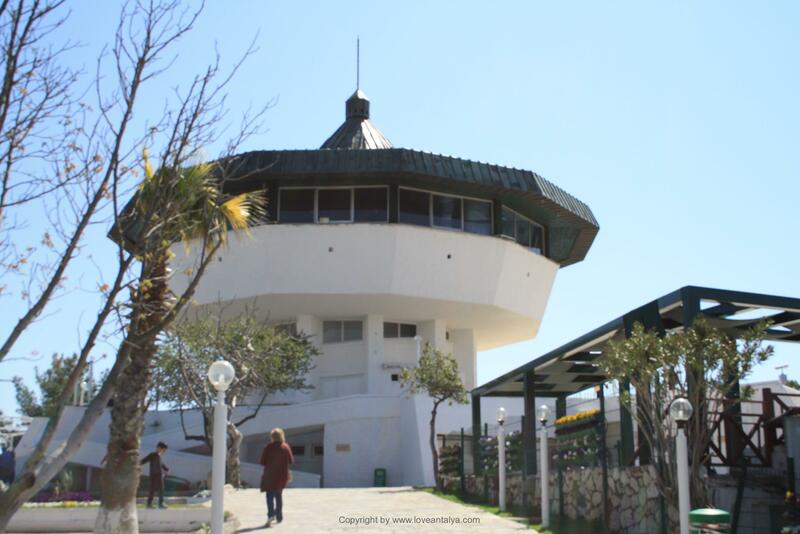 Afterwards, the trip could go to Sarisu Beach park, located right at the entrance of the cable car. Here you can swim in the lovely water and enjoy yourself. Afterwards, you can shop into the nearby kiosk so you can make your own dinner on one of the set barbecues near the beach. Everything is ready for you and you will certainly have a wonderful day.